Luke Wampler of Aspen Velo bike shop takes one of the pedal-assist bicycles for a spin last July. 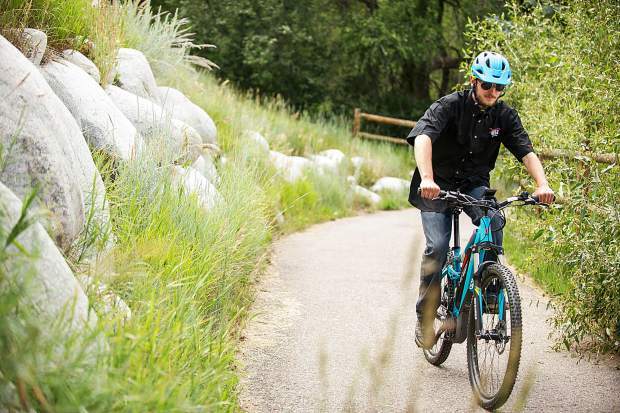 Multiple jurisdictions in the Roaring Fork Valley are going to determine this spring if they can get on the same path regarding use of electric bikes on paved trails. There is a hodgepodge of management currently on the Rio Grande Trail, the heavily used route down the spine of the valley. Roaring Fork Transportation Authority and Glenwood Springs allow use of e-bikes as does Aspen. Pitkin County Open Space and Trails prohibits them. RFTA manages the Rio Grande from Glenwood to the Emma schoolhouse. Pitkin County manages the trail from Emma to Aspen. “It’s going to be impossible for us to govern them without a consistent policy,” said Angela Henderson, RFTA assistant director, project management and facilities operations. The RFTA board of directors voted, 6-2, last fall to allow class I and class II e-bikes. They said they would revisit the issue in 2018. Class I e-bikes engage an electric motor when the rider is peddling and the motor stops when the speed hits 20 mph. A class II bike provides electric power regardless of whether the rider is peddling. It stops when the speed hits 20 mph. Colo. Gov. John Hickenlooper signed into law last year a bill that makes Colorado trails that are authorized for bicycle use open by default to e-bikes unless a local jurisdiction took specific action prohibiting them. 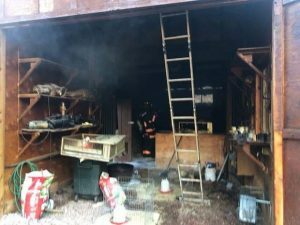 Pitkin County prohibited them but said it would reconsider after it could weigh public opinion. Class III bikes, which are capable of higher speeds without pedal-assist, weren’t automatically allowed by the state law. Trail users will be able to express their opinions in processes that will be held by RFTA and Pitkin County. Gary Tennenbaum, director of Pitkin County Open Space and Trails, said the agency and RFTA hired a public process consultant to help coordinate the meetings. “The goal is to get a consistent policy,” he said. Tennenbaum stressed that the open space program will only consider e-bike use for hard surface trails such as the Rio Grande, Owl Creek Trail and Brush Creek Trail where they are in its jurisdiction. No e-bike use will be considered this year for dirt routes overseen by open space, including the popular routes in Sky Mountain Park. The policy is consistent with the U.S. Forest Service’s stance, which considers e-bikes a motorized vehicle, he said. E-bikes are allowed on forest and county routes open to motorized uses. Tennenbaum said every jurisdiction from Aspen to New Castle will have a chance to be part of the public process this spring. Mark Gould, CEO of Gould Construction, is a proponent of e-bikes on paved trails after experimenting with them last fall to get workers between Glenwood Springs and company headquarters behind Thunder River Market south of Glenwood. The company purchased about 30 bikes for employees to use for commuting. “It worked the way it was supposed to,” he said. The company will sell some of the bikes but it is keeping a handful because they are a convenient way to buzz into Glenwood via the Rio Grande Trail for business meetings, Gould said. He also believes the bikes converted some of his employees into cyclists. He understands the restrictions of the heavy bikes from narrow, dirt mountain bike trails. “This is not about getting on the mountain bike (routes),” Gould said. “This is about the 50- to 60-year-old getting out on the paved trail. He also supports requiring use of bikes that made the rider do some of the work. “You totally missed the point if it’s not pedal-assist,” Gould said. Some people have opposed adding e-bikes on the Rio Grande Trail in the upper valley because it could introduce people who aren’t familiar with trail etiquette and safety onto the route — at a fairly fast speed. “You have the conflicts of adding another user group to a very busy trail system,” Tennenbaum said. Others scoff at the concern, noting that road bikes already zoom along the route at high speeds. It’s a debate occurring around Colorado. Jefferson County Open Space approved a one-year experiment last week to allow class I e-bikes on its extensive network of natural surface trails west of Denver. It will allow class I and class II e-bikes on paved trails. The experiment will be evaluated at the end of the year. In the Roaring Fork Valley, Pitkin County will host public meetings and conduct an electronic survey. RFTA will hold a broader public outreach process in late March and April that seeks public comment on the additional amenities people would like to see along the Rio Grande Trail, desired trail connections and current uses, including e-bikes. RFTA is planning two meetings each in Glenwood Springs, Carbondale, Basalt-El Jebel and Aspen. The goal is to take the results to the RFTA board in May. RFTA and open space said the public meetings would include e-bike demos at trailheads to help people learn more about them firsthand. Henderson said RFTA’s one meeting last fall showed mixed opinions. “It is kind of a 50-50 split in the valley on e-bikes,” she said.